The Cartoon Cave: Follow The Gourd! lol.. and i thought i was the only person who saw this movie....cute! Pete, I wish your gourd was up there. Hi Pete, been watching your blog for a bit but never commented, just wanted to say I love your caricatures, they're the best ever. this movie isnt for real is it? its a joke right? Haha I agree that the redubbed voice is a little too 'hip'. Sorry to say though, guys, but for kids, this looks like a lot of fun! I SECOND THE POOP COMMENT! I GIVE -1 POOP OUT OF 10 POOPS. 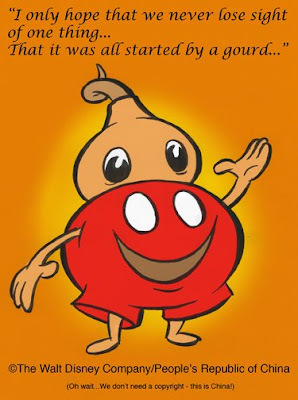 Peter, the most irritating thing about the gourd picture is that it has the Disney name on it. The character design is ugly but original Chinese dialogue may, for all we know, be as 'hip' as the translation. Remember, Disney always was very good at dubbing their films. Not surprisingly, I haven't seen many Chinese children's movies (although, at one point, I found an old animated movie called "Havok in Heaven" and found it pretty charming...somehow, even though I couldn't understand it. I might just put it up on my blog when I'm bored. ), but, my guess is that this is just scratching the surface to weirdness? where can one get there hands on the original, that's what I wanna know. 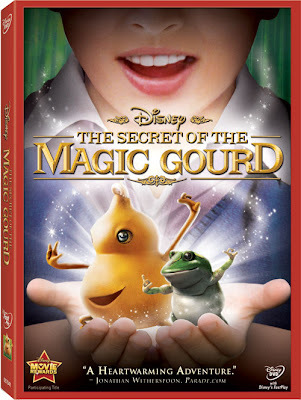 I haven't seen any movies where there is a talking gourd, so I am intrigued. Speaking of the looking like poo aspect, there is a Korean animation by the name of DOGGY POO that is just that. An animated piece of dog poo. Classic. The gourd needs more 'tude.